Let's see, the Mayor of New Orleans, the La state legislature, the 2 La Senators, all the La. congressman, all the US Senators and congressman, all the presidents of this century and the people who chose to build on a river delta have no culpability in this. Nope, only Bush. Your believability sinks with every word and you have quite alot of them in your posts. How long has New Orleans been built and how long have there been hurricanes? Why didn't Truman, Roosevelt, Eisenhower, JFK, Johnson, Carter, Reagan, Bush 41 or Clinton make sure the levees could withstand a hurricane? Because it is a Bush-Bash fest, that's why. 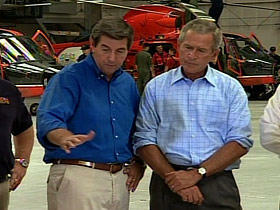 You, kn-know, and I kn-know you kn-know 'cause I kn-know ... about NO, this might've been the perfect storm for Bush to have donned his little action hero outfit and fly around with some of the helicopter crews real up close and personal to the devastation. This might've even given him sort of an idea what it's like to be in a combat zone. What is interesting is his lack of disregard for people who cannot provide him with some sort of press. It is a stark difference and comparison to Bill Jeff Blythe IV Clinton for whom "press" was pressing the flesh (as in shaking hands and getting close to the people, whether in the U.S. or in Engaland or wherever). When a comparable (in effect but not in degree) flood happened in the Red River (of the North) Valley, encompassing the region stretching from Fargo to the Canadian border, Bill Jeff used his military as a backdrop but only long enough to get on a big helicopter and actually tour the area from a few hundred feet rather than a few thousand, that difference in distance once again quite telling. BJ met personally with a smaller town mayor and made the personal commitments that reassured her and the people of her city. Politics was left out of the picture. While politics may be an overriding consideration, there are times when the subject should be more well-hidden than Hussein's weapons programmes. Facts are essential but what has to be gauged are the emotions and impressions of the people affected or sympathetic to the plight of those enduring their worst anymare. While the people can put on nice smiles and clean clothes and spend inordinate amounts of money driving or flying whatever is handy, there are many who have been left with nothing, nothing to smile about, no clothes, no cars, no way to flee their problems, from the raunch to the ranch or wherever. This perfect storm ain't over ... not by a long shot. You can stick your headf in the sand, be in denial, or outright lie about the facts if you like...bvut that doesn't mean the rest of us have to. A simple 5-minute Google search can bring you all the evidence you need to see exactly when the funding stopped for the levee upgrade projects. But I'm sure it's more gratifying to blame Clinton. Jeez, don't you guys ever tire of that? Your guy's been prez for 5 years, and you've run Congress for 11....and you're still blaming Clinton ands the Democrats! My point is you guys have zero credibility when every single problem is the fault of one man. Also, you claim funding ended now that prevented the levee from withstanding above a Cat 3, why was it not complete 50 years ago? You also can't read very well. I had Republicans in my list, not just Clinton. I was not at all taking a cheap shot at Clinton. He with the others had previous opportunity to address this. Yet only Bush has the blame for ALL. I am not saying Bush can be blamed for NONE, neither claim would leave the one claiming believable. It also makes you appear non-concerned about the victims, just concerned about bashing Bush. First I have to say that I am surprised that you don't have that spam blocker thing going on the comments section. I was hoping to see a good comment when I clicked the link, but got the autocad ad instead. But regarding this post, and your blog, OUTSTANDING! I was cashing my paycheck in a Wachovia branch today and they had Bush on a TV monitor. It was during his trip south and he kept deflecting the important issues with comments about how the pipeline was at a higher capacity than expected and that this was a good thing. So I made a comment about it and the teller looked at me like I had three heads. I guess working around all that money causes acute conservatism. LOL. We have no troops and very few National Guardsmen available in New Orleans...why? Because they were all deployed in Iraq, where they are dying in disproportionate numbers for a variety of reasons...but that is another story...Even though we have supposedly sent 40,000, the mayor of New Orleans said that is an outright lie. And why are we in Iraq? Do you really think that you can lay the blame at the feet of anyone else other than G.W? And why are we in the predicament of no National Guard, an Illegal War, and Horrendous Gas Prices? Because GW, from the very beginning of his Presidency has chosen to either fire and/ or ignore anyone who had the balls to tell him the truth about his ill-conceived war. Anyone who chose to play anything other than the sychophant and spoke up to try and tell Bush or Rumsfeld, "No Mr. President,we can't fight this war in a matter of weeks, with a handful of troops!" was given the Texas boot right out the door. And thus here we are, our resources stretched so thin that we can not care for our own in the event of a natural disaster that was out of GW'S hands... well, well, well. I guess even the most powerful man in the world has his limits of control. Bush didn't bank on the war lasting as long as it did and bush didn't bank on Katrina...And as a result he gambled it all on a very bad bet and he has lost big time. Most people in Louisiana feel the way you do..... I am in Louisiana west of the destruction and the sad thing is I'm safe and sound and willing to volunteer yet red cross can't tell me where or how and you can't just walk up and start helping cause you have to fill out forms. I live about 200 miles away and our very, very small town has about 350 victims at least and red cross said, "sorry can't help" so our little town it doing it's best to keep every body with what they need. If you wanna donate to victims that red cross isn't helping and the gov. isn't fast enough to help....go to www.mbdr.org it's the little place that all the different religious leaders of our town put together to help these people who are living in tents during 115 degree heat (with the heat index). Louisiana's small towns need help to help the victims that overflowed to our towns. Thanks so much for your concerns sometimes that's all these people get.